You get attractive results in 3 EASY steps: Write, Peel and Stick. Endlessly REUSABLE - you can switch contents for your jars whenever you need - Effortless Wipe Off the writing, Peel and Re-stick. Their fineness makes them REMOVABLE with No Mess. Write on with traditional chalk or use the Liquid Chalk Pen and wipe clean with a damp cloth. WIDE RANGE OF USE:Decorate your mason jars, jelly jars, spice jars,bottles,callseroles,home-made lotion bottles,wine glasses,canisters,baskets,office supplies,toy bins. REVERSIBLE TIP DESIGN CHALK MARKER:3MM premium white liquid chalk marker pen has 2 reversible tips (chisel & bullet).Just pull out the tip and change it with the other end.safety and non-toxic, no dust, fumes or harsh chemicals; safe around children and animals. Notes: A new pen point was dry because it is new which haven't be used , the ink inside the pen body. Please shake and then push down the pen point ( each around 10 times) then to writing. THE STYLISH ORGANIZER'S BEST FRIEND：Stickers are decorating and organizing your cupboards, pantry storage, garage, containers, office, weddings,parties, bakeries, coffee shop, craft projects, walls and kids bedrooms. 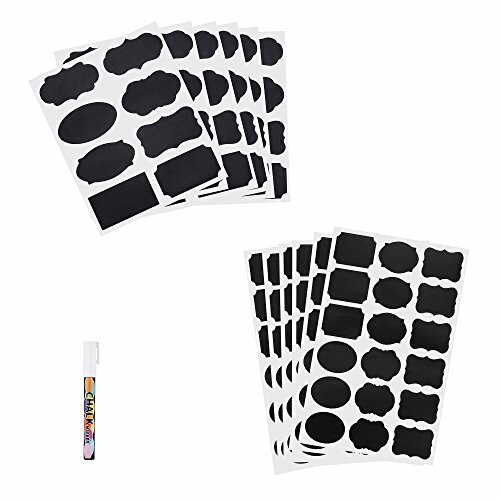 REUSABLE: Our chalkboard labels can be used over and over. Need to change the label? It's easy! Simply wipe with a damp cloth and re-write. If you have any questions about this product by Jecopan, contact us by completing and submitting the form below. If you are looking for a specif part number, please include it with your message.